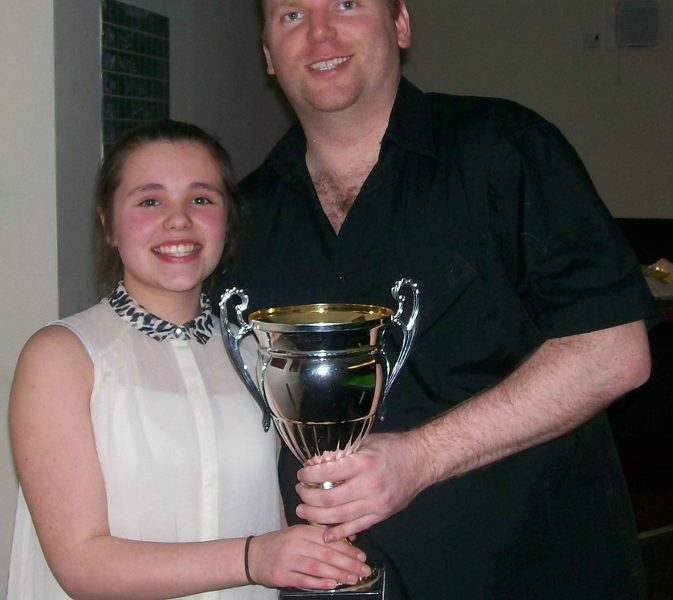 ELEVEN-year-old Chloe White set ’em up and Pascal Richard knocked’em in as the all-conquering double act from Copnor Snooker Club landed the Portsmouth league’s handicap pairs trophy. But the final at the Carlton Club was more like a re-make of The Generation Game. White and Richard, 33, defeated their veteran clubmates and last season’s runners-up Dennis Hushley, 84, and 69-year-old John Oldfield 3-1 to claim the Sid Matthews Cup. Some “fabulous safety” from White created the chances for Richard to compile two 60+ breaks. Richard reckons his young playing partner demonstrated “nerves of steel” throughout their five matches in the competition run by the Portsmouth District Billiards & Snooker Association. “She barely left the other teams a sniff,” Richard told cuestars.co.uk. “I couldn’t have potted the balls without her creating the openings for me. “She has played her role perfectly, inasmuch as she has potted the easy ones then ran for the long grass when faced with difficulties. And she has shown nerves of steel, sinking frame ball on a few occasions. Not surprisingly, it was White’s first major trophy in the Portsmouth league. Copnor SC’s joint coach Scott Compton said White’s game had gone from strength to strength since joining the Cuestars setup. And he predicted that with the right coaching, she could be a future Portsmouth champion. He also said that the club’s young Cuestars have all vastly improved and they will only get better as the seasons go by. White’s proud parents saw their young daughter lift the trophy. Mum Jenny couldn’t watch the action so she stayed outside the room, looking in occasionally to see how they were doing. In the quarter-finals, White and Richard accounted for Nigel Ward and Emma Bonney (Craneswater) 3-1. Bonney is ranked third on the World Ladies Billiards & Snooker Association circuit. And they knocked out defending champions Mike Talmondt and Pedro Ferguson (Craneswater) 3-1 in the last-four.